Hubby and I went to Pentravel in Cresta for their new brochures launch the other evening. 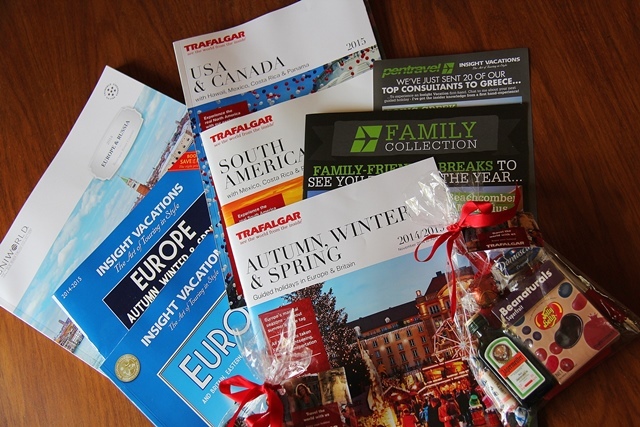 We came away with a goodie bag each filled with the latest Trafalgar brochures and a ‘goodie/sweetie’ pack, which included a nice leather Trafalgar luggage tag which everyone on our last two Trafalgar tours seemed to have except us! Now we have them .. sooooo … where do we go next? !!!!!!! Where do we go for our next overseas trip? Crossing fingers and toes that we do have the opportunity to travel abroad again, that is! We thoroughly enjoyed our Best of France and Best of Italy Trafalgar Tours, but maybe we should look at other organized tours. Insight Vacations apparently are slightly different, all (or most) excursions are included in the cost of the tour, unlike Trafalgar which has optional excursions, adding to the cost of the whole tour. You are told about them beforehand, when planning a trip, but on our first tour, we planned not to so them all, if any. Once on the tour we realised that we didn’t want to miss out on anything that was offered. And we noticed that most optional excursions included a meal, whether it be lunch or dinner, saving the hassle of looking for a place to eat, as well as gaining more of an insight of the place/s of interest. Some fellow travellers had other agendas instead of a couple of the optional excursions which is understandable ie catching up with their washing! Quite a few couples on our tours were not only doing the one tour, but another, or several others hence the need to keep up to date with their washing ! We were given another brochure as we mentioned our desire to do a river cruise as an option. Wowee … these are amazing !!!!!! Uniworld’s Boutique River Cruise Collection. OMW!! How I would love to go on one of these! Rather costly but incredible !! There was a couple at the brochure launch who had been on several! They raved about the luxury, friendliness and attentiveness, superb meals, etc .. etc … etc!! Sooooo .. I have lots of reading to do, choices to make, narrowing those choices down to one .. our next overseas holiday, hopefully next year …. holding thumbs, crossing fingers and toes ! Where to go? Where to go? A different continent this time perhaps?